GymnasticStrong is dedicated to providing the global gymnastic community with resources to improve the well being and health of its athletes, as well as give them the physical tools to improve and master their skills. Athletes in such a physically demanding sport require extremely high levels of core stability and strength, functional upper and lower body strength, flexibility, and balance. To perform at a high level while preventing injury, gymnasts need the proper conditioning to prepare their bodies for the demands of the sport. GymnasticStrong has created age-based programs that will provide gymnasts with functionally based exercise progressions that relate directly to their physical needs in gymnastics, while assisting in preventing the most common gymnastic injuries. Get a unique perspective on exercises from the combination of expertise from a physical therapist and a strength and conditioning specialist, a great combination! Lauren Downes, MSPT received her Masters degree in physical therapy from Boston University in 1999. She has practiced as a physical therapist in sports medicine and orthopedic clinics in New York and Massachusetts since 2000, and has attended numerous functional strength and conditioning seminars. She has resided at Attain Therapy and Fitness, a leading Massachusetts sports medicine and fitness facility, since 2006. Lauren has a special interest in treatment of athletes and preparing them for return to sports. Also a figure skating professional and accomplished off-ice trainer, Lauren founded 'Sk8Strong' in 2008, which has become the worldwide leader of strength and conditioning programs for figure skaters. Lauren has developed personalized strength and conditioning programs for beginner to elite level skaters throughout the United States, and regularly conducts seminars for coaches, skaters, and parents. The Sk8Strong DVD series is currently used in over 40 countries and throughout the top figure skating training camps in the United States. As the mother an aspiring gymnast, she is excited to transfer her knowledge of injury prevention and strength training to the sport of gymnastics. Stephen Conca: Since 1996 Stephen Conca has spent his career improving the performance of athletes at every level of competition in virtually every major sport. In the Spring of 2008, we teamed up to provide the figure skating community with the knowledge and resources that the sports science world has to offer, and have moved on to gymnastics community with the similar resources. In "traditional" sports such as soccer, baseball, tennis, football and basketball, the world of sports science has evolved to provide athletes with the know how to resist injury, become stronger, move faster, and enhance flexibility and balance, and gymnastics is no different. 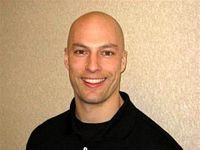 Stephen is a Certified Strength and Conditioning Specialist through the National Strength and Conditioning Association. Coach Conca is also recognized by the National Academy of Sports Medicine as a Certified Performance Enhancement Specialist. Stephen earned his degree in Exercise and Sports Science at the University of North Carolina at Greensboro in 1994. Soon after, he began his career in athletic performance at Orthopedic and Sports Physical Therapy (Danville, VA), focusing mainly on the rehabilitative process after sports injuries and surgical interventions. Stephen had the privilege of working with nationally recognized physical therapist and strength coach Gray Cook. Stephen became part of Gray's team as he developed the Functional Movement Screen (FMS), an innovative system used to evaluate movement pattern quality in athletes. Recognizing the growing demand for quality performance-based training, injury prevention and sports-specific conditioning, Stephen co-founded East Coast Athletics (ECA) in 1999. ECA's mission was to serve the community's athletic population as an adjunct training ground to the actual playing field. Stephen's goal was to offer the highest level of sports performance instruction with the most knowledgeable staff. Through Stephen's rapport with the largest orthopedic group in the region, ECA became an integral service to the many community sports associations. In 2008 Stephen took the success he had in North Carolina and began the co-development of ATTAIN Sports Performance with Performance Rehabilitation in East Longmeadow, MA. Steve acted as the director of Sk8Strong and GymnasticStrong videos. He now operates his own strength and conditioning facility in West Springfield, MA, "Conca Sport and Fitness."